Tagline: When the sun comes up, the girl of his dreams will murder him. The name is Tepes. Nicolae Tepes. I'm a federal agent with Hex Division. When the sun comes up, the girl of my dreams is going to kill me. My partner's a werewolf, but we get along okay. We were investigating this murder when we stumbled across a conspiracy unlike anything we've ever dealt with before. Ghostmortems, Scarevoyants, all kinds of freaks. It started bad and got worse quick: a psychic on our team had a vision of the future. At sunrise, I'll die at the hands of the woman I love, and then a psychotic death cult will deploy a supernatural weapon of mass destruction. I holstered my gun. "Right. Let's toss the place." Zheng flipped the mattress over. other. I hauled open a few more drawers; in each one, more throwing stars. half-dozen circular saw blades gleamed on the boxspring. "Ambush," I said. I drew my gun. I snapped my fangs. After a minute, I relaxed. "Okay," I said. "Nobody here. Let's keep searching." scattering saw blades all over the carpet. "Jesus on the cross," Zheng said. crimson meter-high all-caps. My legs felt like concrete. cautiously. They hovered. Zheng turned to follow me into the bathroom. them, the saw blades spun forward. wrench itself out of the floor. Zheng lunged for the bed frame. "Get it off the door," she snarled. I slid back across the tiles. Saw blades thunked into the door. could survive a six-story fall, no problem. "Can't get through," she yelled back. "Any windows in there?" stuck in the bone. If I pulled it loose, it might go for my eyes. teeth poking forward as I reached for the doorknob. halfway through the door. I backed up. shook violently as they tried to wrench themselves loose. had tried to claw her way through to the next room. to pass through them would hack me into strips. monstrous fangs in her mouth. Behind her, a swarm of shuriken wheeled and dove. "Behind you." "Two pulses, both slow. All this yelling, they should be worried. But they're not. Whoever they are, they're asleep." what, ten? How long before I passed out and got decapitated? up the dresser and chucked it at them. Ignoring my protests, she hoisted me up. 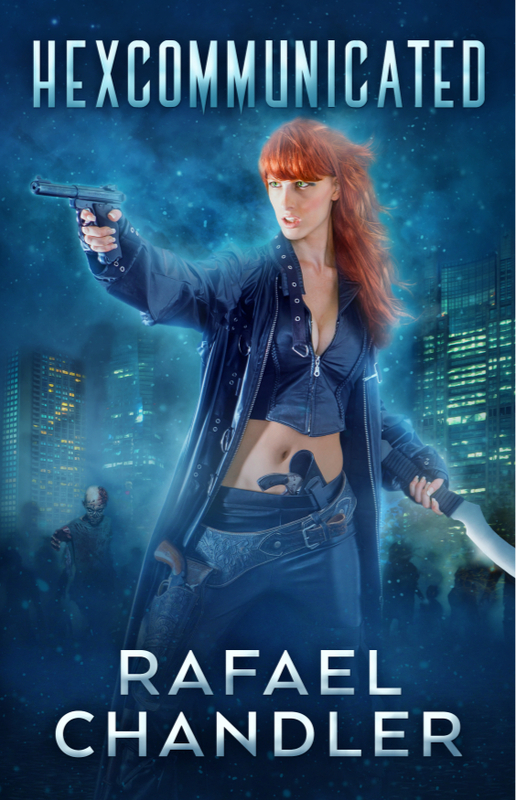 Rafael Chandler writes novels (Mask Beneath Her Face, The Astounding Antagonists), video games (SOCOM 4, Rainbow Six: Lockdown), and tabletop role-playing games (Teratic Tome, Lusus Naturae). He's a metalhead, kaijuphile, and gorehound. Typically, I start with a single image, and extrapolate from there. For The Astounding Antagonists, I had this mental picture of a group of comic-book supervillains who rob banks as a political statement against billionaire superheroes. They're not in it for the money. They're trying to stick it to the Man! For Dracula: The Modern Prometheus, I envisioned a female vampire who despaired of ever creating a vampire like herself -- all of the people she bit turned into mindless predators -- so she created a companion from dead bodies. I saw Countess Dracula stitching her creation up, connecting the electrodes, mixing chemicals in her lab. 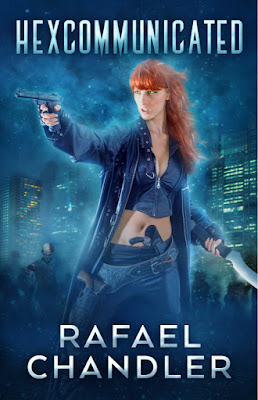 For Hexcommunicated, I saw a vampire with a badge and a gun -- a federal agent who kicked down doors and got into high-speed chases while pursuing zombies, werewolves, and other creatures of the night. But the investigation went south, and I pictured him facing all kinds of new national security threats, weird stuff the vampire had never encountered before. For instance, Handroids, these severed human hands with wires and circuits, scrambling out of a box to swarm over him while he cursed and tried to pull them off. While writing Hexcommunicated, I read a lot of books and articles about military plans involving the supernatural. I discovered that truth really is stranger than fiction. For example, the OSS had a plan involving glowing foxes. See, during WW2, there was a proposal to use foxes to demoralize and frighten Japanese soldiers. In Shinto religion, foxes are seen as sneaky or evil. The OSS decided to cover foxes with glow-in-the-dark paint and release them in war zones. They tested their plan in New York, by releasing a few dozen glowing foxes in Central Park. Predictably, people freaked out. The test was judged a success, so the plan was given the green light, but while they were trying to catch all the foxes, the war ended. I work in video game development, and I design tabletop role-playing game sourcebooks. I've been working in the video game business since 2000. For most of that time, I've worked as a scriptwriter and story designer for companies like Sony, Ubisoft, Gameloft, and Kabam. My job requires me to create plots, develop characters, and write dialogue. I've also done some copywriting (back-of-the-box text, social media content, that sort of thing) and I've worked with voice actors a bit (casting them, directing them). I've worked on several of the Tom Clancy games (for instance, I wrote Rainbow Six: Lockdown), and I've worked as a writer on three games in the SOCOM series. It's a fun job! When I'm not writing novels or video games, I create sourcebooks for tabletop role-playing games. Most of my creations are compatible with old-school versions of Dungeons & Dragons. One of my favorite projects was the Teratic Tome, a tribute to the Monster Manuals of my childhook. Teratic Tome features about a hundred new monsters, including the Curhadac, a hideous demon that abducts several victims, kills them one by one, and makes art from their corpses (for example, a paintbrush made of bone and hair, a canvas made of skin, and pigments from bodily fluids). One victim is left alive and unharmed; the Curhadac gives the victim the artwork as a gift, and then leaves. I'd head back about 100 million years and check out the Cretaceous. I'd love to see a Spinosaur. I'm currently working on a massive new RPG sourcebook (seriously, it'll be two or three times the length of any novel I've written), and I'm also writing a novel about a superheroine trying to defend her city against a terrifying crime wave.